Welcome to the second edition! For the first part from our previous trip, click over HERE. The best sunny day cool down! 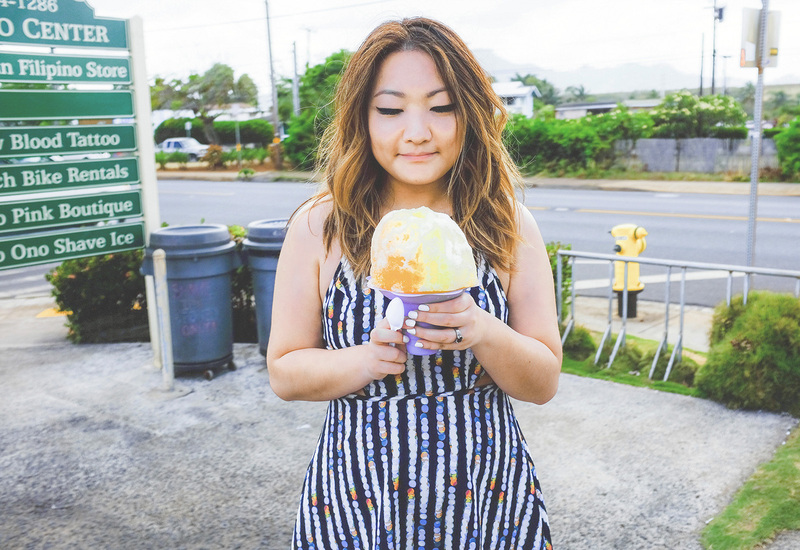 In Kapaa (where all the good food is for me), we stopped for this sweet treat that’s large enough for two. There’s a wide range of flavors that you can customize, ice creams and halo halo. 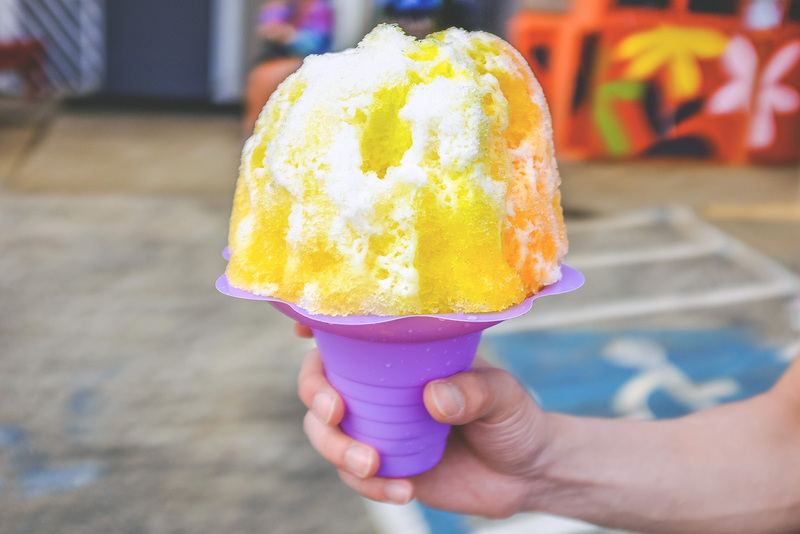 We ordered the Kauai Sunrise (passion fruit, pineapple, coconut, mango) with coffee ice cream in the center and a coconut snowcap. Yummy! Our first meal in Hawaii! It is a few minutes from the airport in Lihue, so it’s pretty convenient whether you’re coming or going. This place was actually recommended by locals the first time we were here, so I’m happy we finally got to check it out. 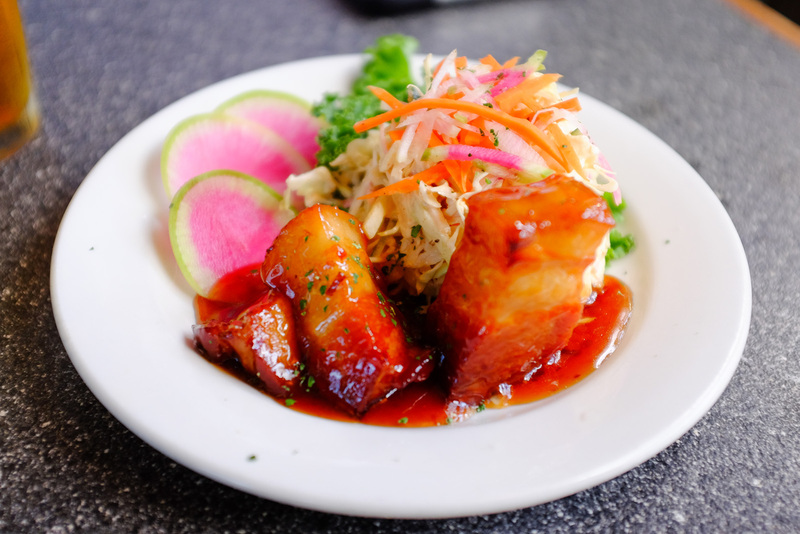 We shared the braised pork belly appetizer. It was amazing, by the way, but how can it be otherwise, ever?! For me, I ordered the fish tacos and for him, the kalua pork. Pretty much my favorite morning spot. We stayed in Princeville again, so, Hanalei was a quick drive away. This place serves the best coffee ever! I was definitely a repeat customer almost every morning for a cup of iced Thai. 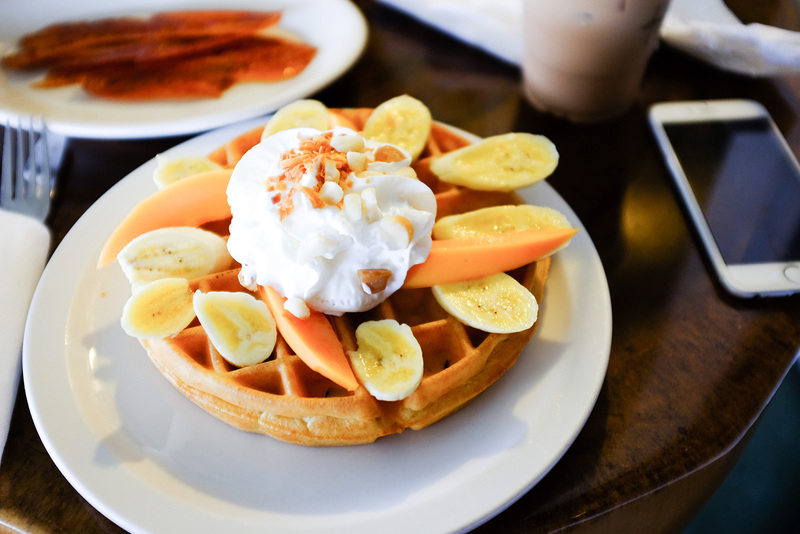 We also sat down for breakfast and I got the Kauai Waffle both times. The best thing? They serve it with coconut syrup. Yep! I actually came here in search for some poke after a long day of road-tripping down the coast. We ended ordering the same thing, which was the pork lau lau plate that comes with poke, salmon lomi lomi and chicken long rice. 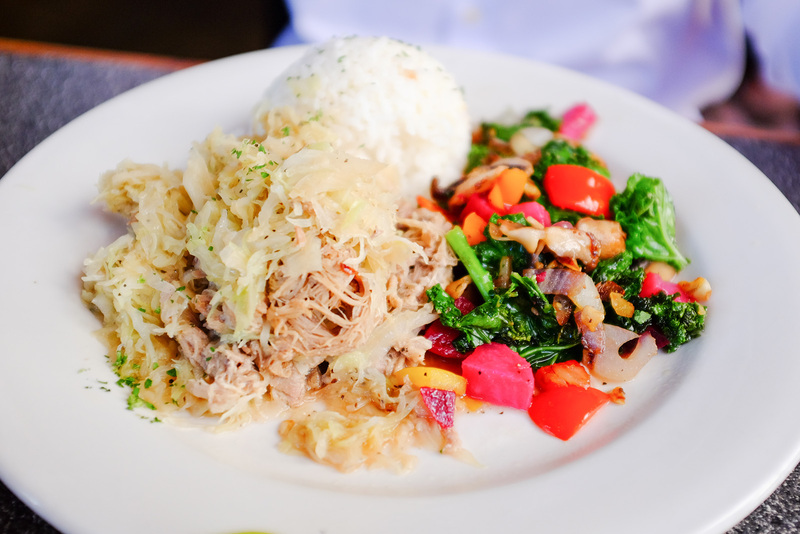 He also got a side of the kalua pork. Absolutely delicious. Honestly, I don’t think I’ve ever had a bad meal on the island. One of the rare occasions that we actually sat down to eat was here for brunch! I debated about going back to the buffet brunch at the St. Regis, but quickly dismissed it for tasting new places. 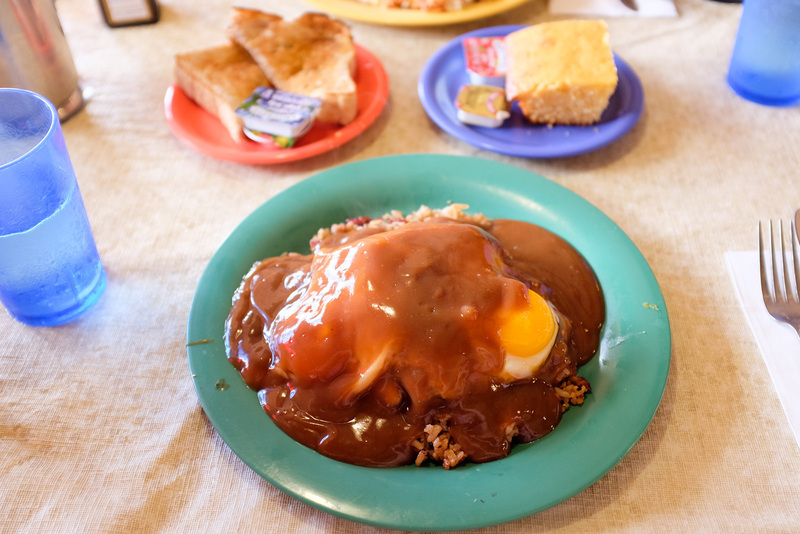 I ordered the loco moco special, which was with fried rice (usually with white rice). It is the ultimate comfort food, a burger patty topped with eggs with gravy all over. 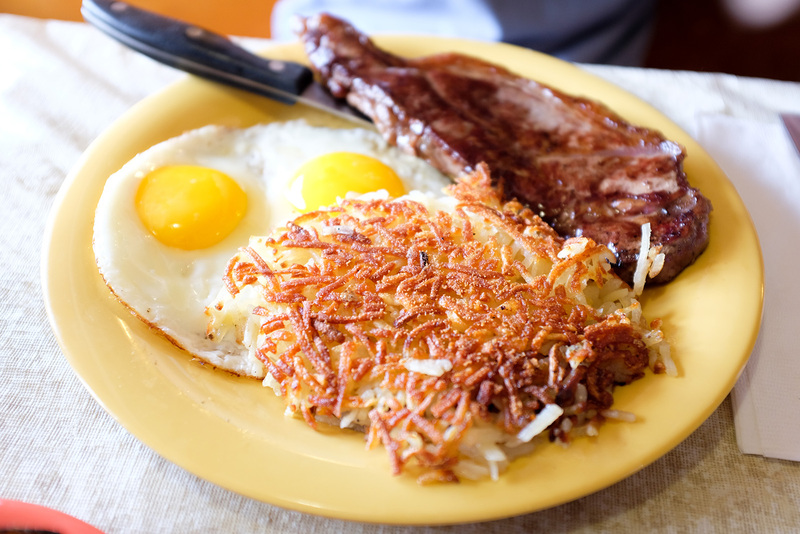 He got the steak and eggs. The portions was large here, too. I left fully stuffed. Oh yeah, my meal came with cornbread. So winning. I’m here for their lobster salad. It left me savoring for more. I think I’m going to try to make this at home. 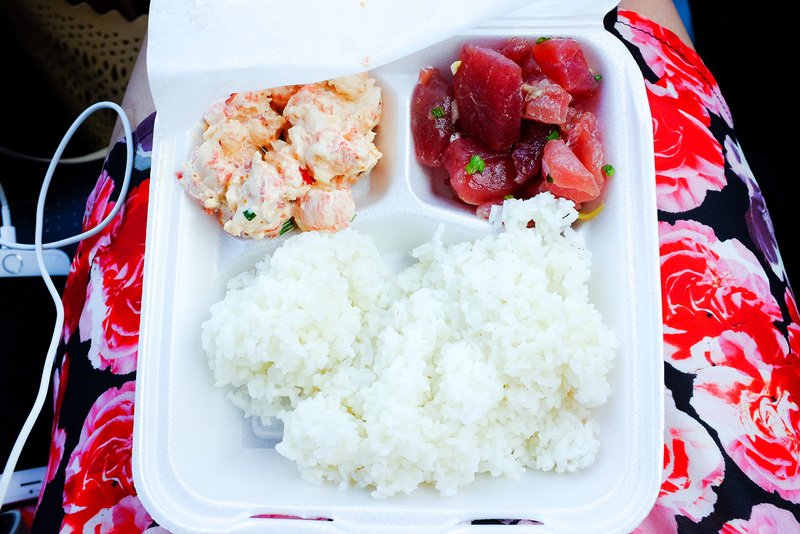 I ordered a lunch box of that with ahi poke and rice. I wish I can eat like this everyday! I originally wanted the fried chicken, but they ran out. Andy got the last scrumptious pieces. 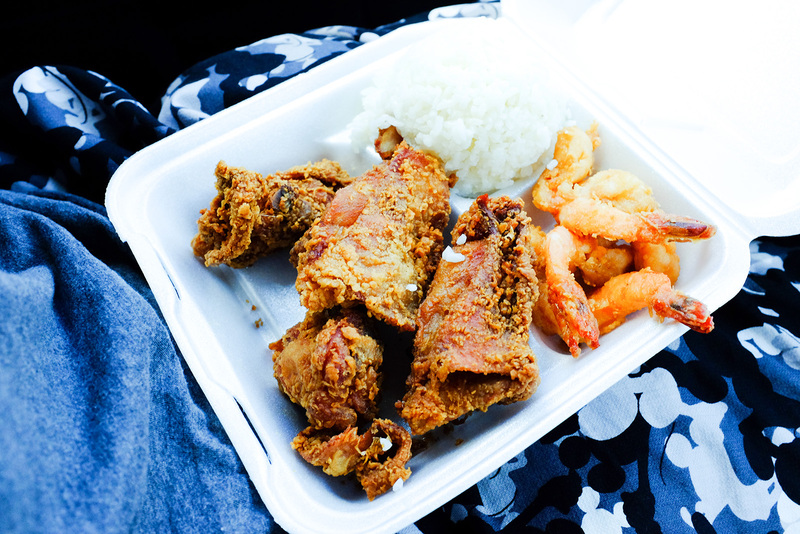 Of course, I tried one from his fried chicken and shrimp plate. Since, we’re on vacation, it’s okay to be bad, am I right?! 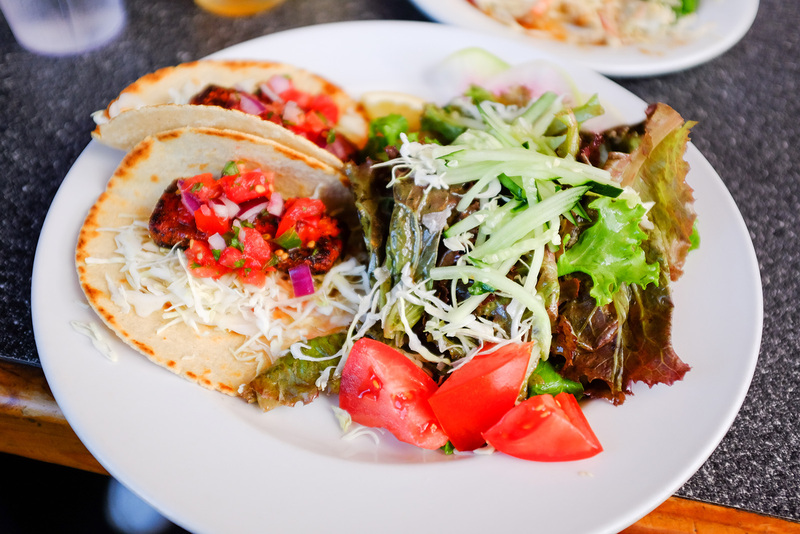 I’m pretty sure it’s one of the best places for tacos on Kauai. We drove here after a super long day and got our taco fixes. I ordered the fish tacos and he got the chorizo. The fish was succulent and the flavors were spot on! 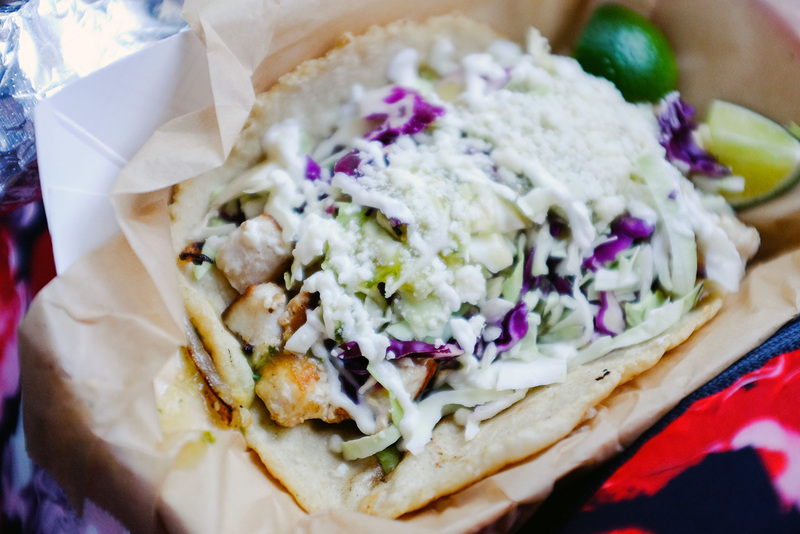 If fish and pork isn’t your thing, they have a menu with other meats and veggies. Having options is always a great thing. Needlessly to say, we inhaled our dinner. The most popular place for saimin, four generations and counting. We picked up two extra large “bowls” to go and picnicked on the beach. It was really interesting for me to try saimin, being a huge ramen fan. It’s like a bowl of ramen collided with Cantonese wonton noodle soup. Needless to say, it was a good bowl. I wouldn’t order the XL next time. The portion was so large! We went to the location closest to us in Hanalei. The burger was good, if you like McDonald’s burgers. It looked and tasted the same exact way. They were also a little small. I would like to try their other burger options, because people seem to love this place. Or, I could be a burger snob. New York can do that to a person. Oh wow! Please take me back. If you love garlic and you love shrimp, this is your place. I ordered the garlic shrimp plate and he got the Brazilian shrimp. I think I like his more, hehe. They were both delicious and packed with flavor. For convenience, I would probably pay extra for de-shelled shrimp. We took it to our villa and dug in. It was late and we were famished from the day. We ordered burritos from here to eat in our villa. Andy loves driving out to get stuff since city living doesn’t really allow for that often. I got a fish burrito and he got carnitas. They taste really good, especially the guacamole. Who would have thought we’d be great amazing Mexican down here in Hawaii. Feels like home. I could order a guac and chips from them and just snack all day. All about the flavor and seasoning. I’ve mentioned this market in the first post, but I need to talk about it again. We pick up food here all the time, so much so, that we have a loyalty card. LOL. They have an amazing selection of poke, where you can order poke and rice bowls or just the poke. Also, the musubiiiiiiiii. 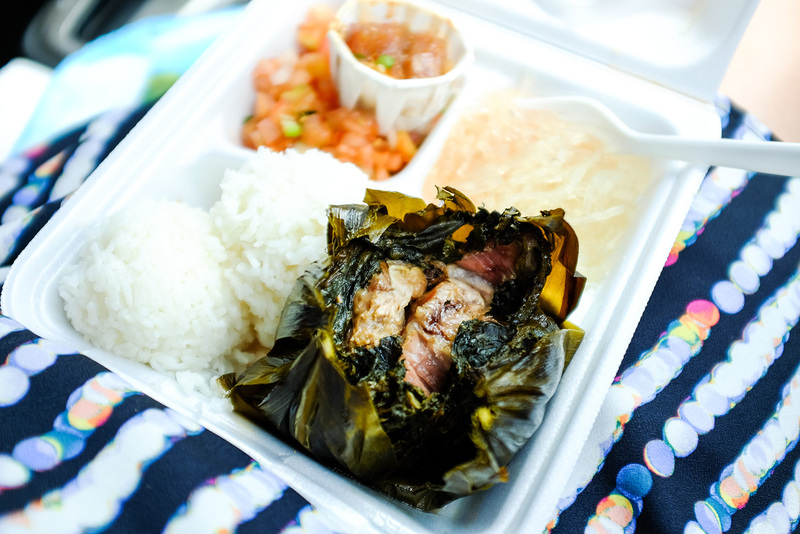 Okay, I was really bummed the last trip because everywhere we went, the spam musubi was sold out by the time we got there. This year, we stocked up! I really love the spam musubi, but the chicken one was fantastic as well. We’d buy a bunch and leave it in the fridge for snacking. Besides food, it’s also a supermarket where we grabbed everything else for our villa. ….and that’s it! 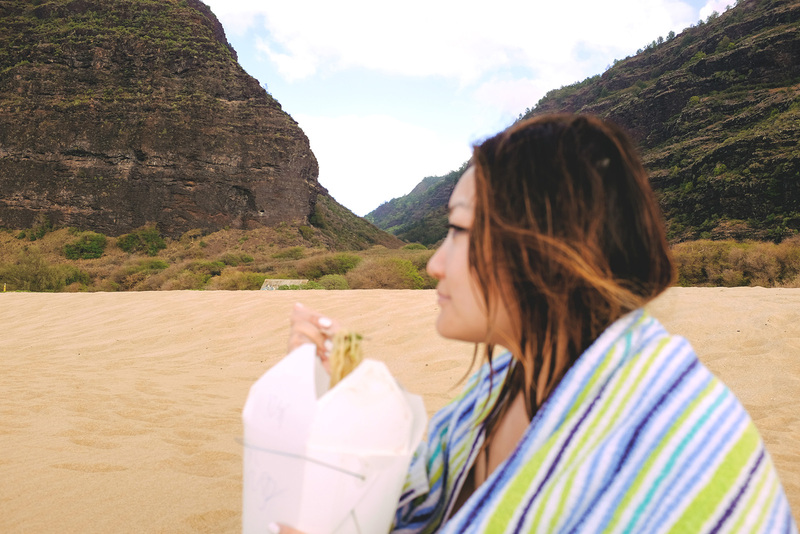 A round up of our foodie adventures on Kauai. Most were take-out at really awesome places. We like to go where the locals love to go. Our first trip has more sit-down and fancier options. This time around, we were always on the go, exploring the rest of the island. Confused about the food jargon in the post? Check out my Beginner’s Guide to Hawaiian Dishes, below! I am getting too hungry reading this! YUM!